The main classification criteria are: type of movement (falls, topples, slides spreads, flows), and type of material involved in the movement (rock, debris, earth). Combining movement and material type terms enables an appropriately descriptive landslide name to be formulated. Naming can become more detailed with the addition of other descriptive details related to activity state, water content , rate of movement, etc., if known (e.g. active, complex, extremely rapid, dry rock fall-debris flow). 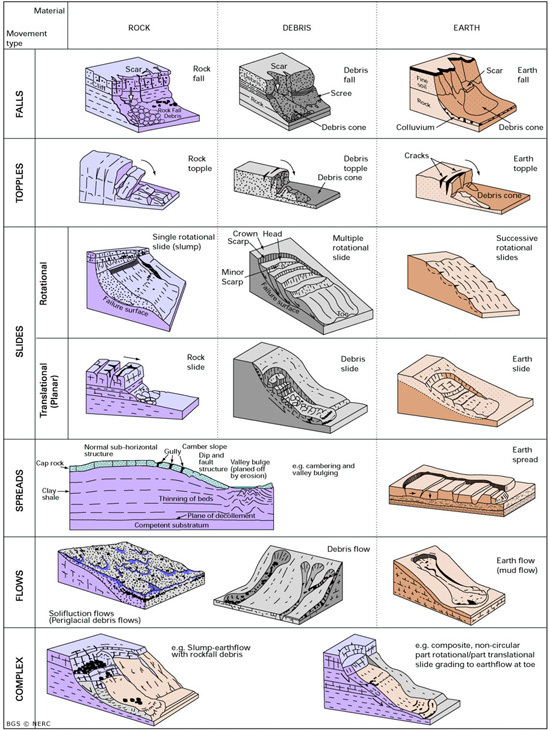 Surely the image needs to be accompanied by an illustrative taxonomy of mitigative measures against landslides showing a wide spectrum of programs and strategies for inhabiting the geological wilderness. The best way to avoid landslides is to look up before you build anywhere. If there's rock or soil above you, sooner or later its going to come down. Trust me. Remember, natural disasters are only disasters if we humans happen to get in the way of normal geologic events.